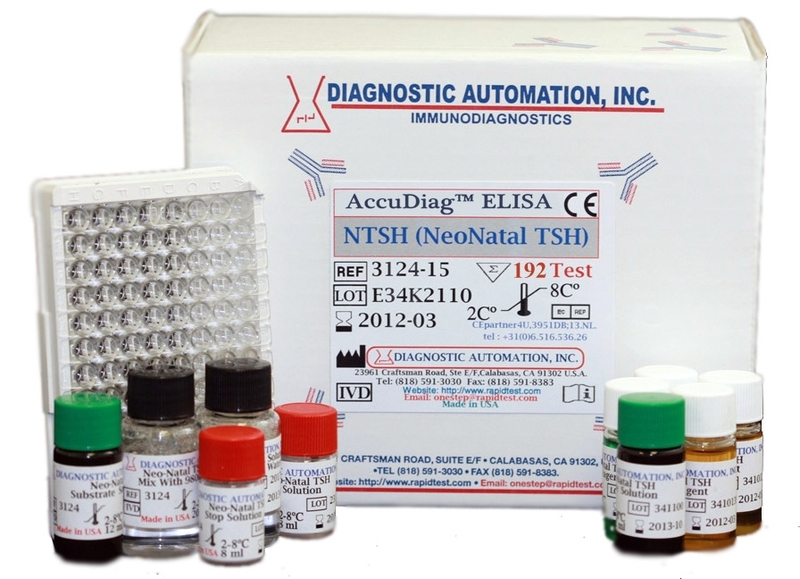 TSH ELISA kit - TSH ELISA test | FDA-CE | 818-591 3030-USA. 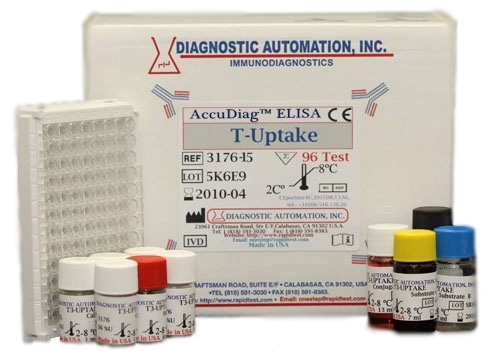 The Diagnostic Automation TSH ELISA is intended for the quantitative determination of the thyroid stimulating hormone (TSH) concentration in human serum. 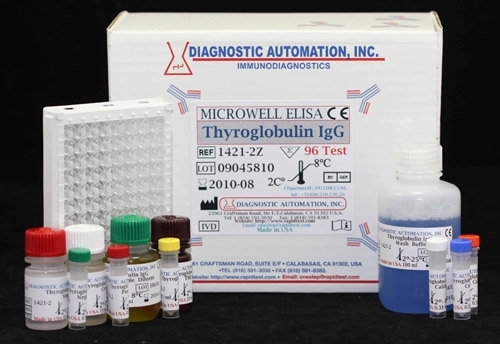 The determination of serum or plasma levels of thyroid stimulating hormone (TSH) or Thyrotropin is recognized as a sensitive method in the diagnosis of primary and secondary hypothyroidism. TSH is secreted by the anterior lobe of the pituitary gland and induces the production and release of thyroxine and triiodothyronine from the thyroid gland. The release of TSH is regulated by a TSH-releasing hormone (TRH) produced by the hypothalamus. The levels of TSH and TRH are inversely related to the level of thyroid hormone. TSH and the pituitary glycoproteins: luteinizing hormonee (LH), follicle-stimulating hormone (FSH), and human chorionic gonadotropin (hCG), have identical alpha chains. The beta chain is distinct but does containidentical amino acid sequences, which can cause considerable cross-reactivity with some polyclonal TSH antisera. 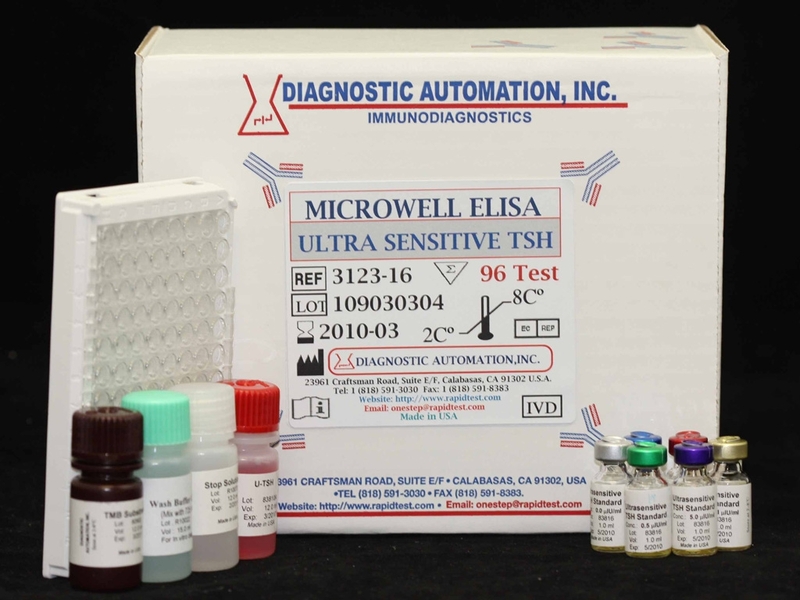 The use of a monoclonal antibody in this TSH EIA test eliminates this interference. 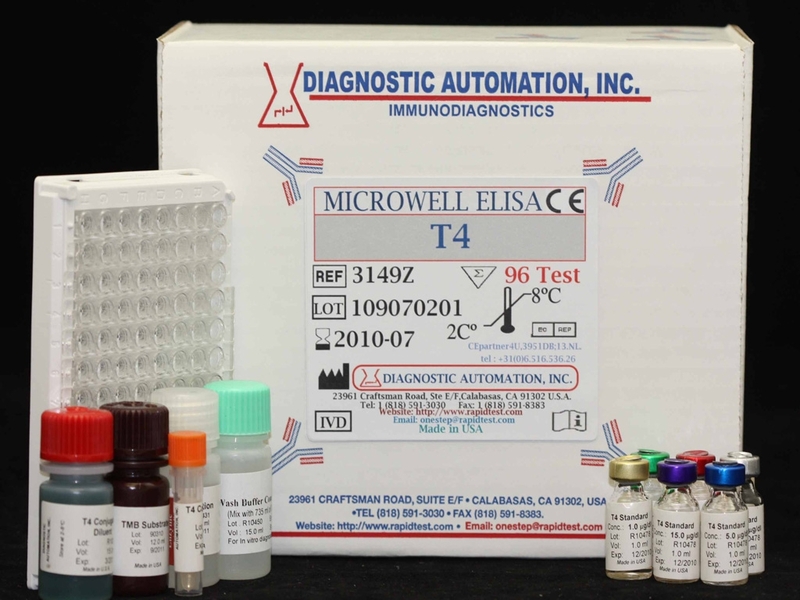 The TSH EIA test is based on the principle of a solid phase enzyme-linked immunosorbent assay. 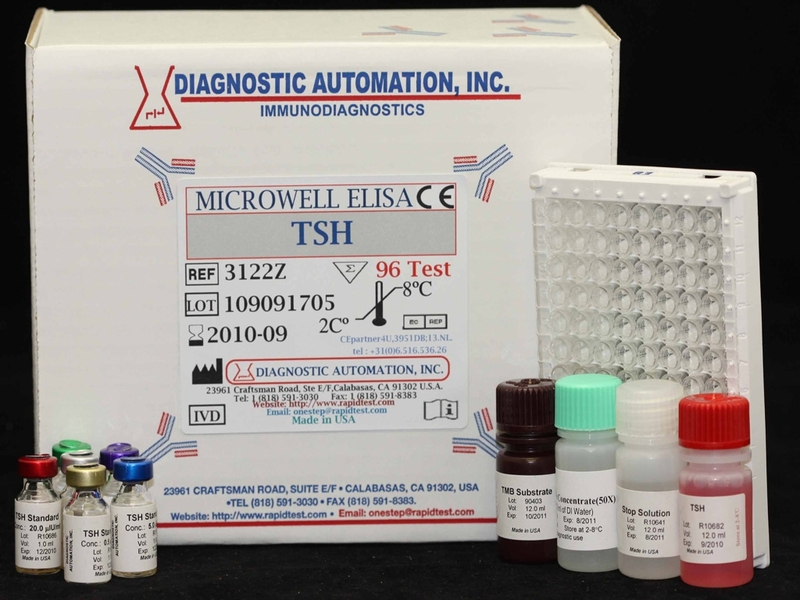 The assay system utilizes a unique monoclonal antibody directed against a distinct antigenic determinant on the intact TSH molecule. Mouse monoclonal anti-TSH antibody is used for (microtiter wells immobilization and a goat anti-TSH antibody is in the antibody-enzyme HRP conjugate solution. The test sample is allowed to react simultaneously with the two antibodies, resulting in the TSH molecules being sandwiched between the solid phase and enzyme-linked antibodies. For additional details please refer to the instructions for use.